We had visited the Greek lands some time ago, but we weren't able to stay for as long as we expected. Thus, we missed out on some great things. Some of them were, of course, the Greek islands - Crete amongst them. Crete is the biggest Greek island (and a very popular touristic destination), so we figured we'd start this season's traveling experience there. We couldn't be any happier with our decision, it was amazing. At first, we underestimated the importance of Crete (and so do the great majority of tourists according to locals). We thought of it as a vocational part of Greece, when in reality, the island plays a major role in the Greek economy, as well as in its culture. Don't get me wrong though, during our visit to Crete we learned about the completely independent Cretan culture. The island counts with its own traditions, cultural practices, cuisine, and a very interesting history, too. It is thought that Crete was home to the very first human civilization in the whole European continent, the Minoan. Sadly, we weren't able to find any sort of touristic guidance to ruins or buildings from past (or ancient) civilizations. We did, however, learn about Crete through history and cultures it has belonged to. As for the environment, Crete has a fair amount of mountains and valleys. The mountains vary a lot in height, shape, type, and extension. We started our mountainous trip at the White Mountains, as recommended by locals. Although we were a bit sad to find out the mountains weren't actually white, we enjoyed our hike a lot. Their peaks are eternally white (thus their name), as the white-ish color of limestone disguises the peaks when it's not snowing. Some of the valleys were pretty, pretty high. Their imposing height makes them wonderful to stare at, regardless. At the same time, there's a load of plateaus (which we learned that are very fertile, surprisingly to us). However, the most exciting part of our mountain experience was undoubtedly the caves. The caves are not only fascinating, but some of them are part of the ancient Greek culture. The Ideon cave was a great experience for us; its structure and history are goose-bumping. At first sight, it was just a cave; little did we know this cave was actually an ancient Greek sanctuary, considered to be as important as any Greek temple! The ancient cave's popularity dates back all the way to around 4,000 BC. Although there's some controversy about the topic, it's thought that Zeus, the father of all Greek Gods, was born in this cave and posteriorly grew up in it. The story about the birth of Zeus in Crete is very rich, and fascinating to hear. We did a lot of fun stuff - but the cave of Zeus just beats them all. Crete is very prepared for tourism in general; from rental apartments to high-end touristic facilities, and luxury hotels (if that's your thing). The beaches are arguably the most visited areas of Crete during holidays. 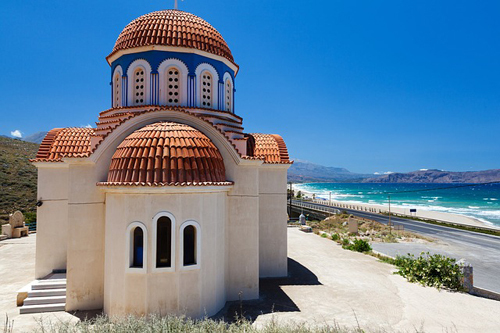 At the same time, Crete is surrounded by groups of smaller islands - which also happen to be very popular destinations. Some of these smaller islands count with some of the most beautiful beaches of Greece, while others hold very valuable archeological and biological information about previous civilizations (the Minoan civilization, mainly). We visited one of the isles, the Palm Beach of Vai, which happened to be the largest natural forest of palms in the continent, and it was gorgeous. In general, Crete was a very satisfying experience. We learned just as much as we enjoyed; it's one of those destinations with both a rich history and great tourism (although it has some chilling stories, too). One thing is for sure - we're going back to the Greek islands.